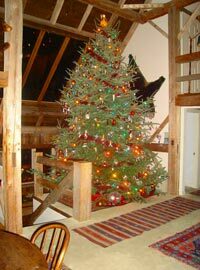 The Lodge at Millstone Hill offers one of the most distinctive settings for meetings and events in all of Central Vermont. The Great Room and other common areas at The Lodge can be rented to host any number of business meetings or social occasions. The warmth and drama of our interior space, the inspiring views of our hilltop location, and the opportunities offered by our 70-mile trail network can be combined to create a truly memorable meeting or event. Millstone Hill has a ground-floor function room which can comfortably seat up to 50 people. This room is perfect for parties, showers, rehearsal dinners, business meetings or retreats, office Christmas parties, or any other such gathering. It is also state-certified as handicap accessible. You can bring your own food, we can provide you with a variety of warm or cold menu choices, or we can connect you to a number of excellent caterers, as you wish. We invite you to call or stop by to discuss how we might combine the various space options and menu choices available at Millstone Hill, to perfectly suit your needs. Why plan just another party or meeting when The Lodge at Millstone Hill can help you pull together something truly unique. 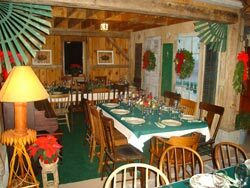 When renting entire Lodge (all 5 bedrooms), use of the Function Room and Caterer’s kitchen is NOT included. A surcharge will be applied if used without permission. If you would like to add overnight accommodations to your meeting or event, contact us for special discounted rates.